10 short conversation-completion exercises for practice using "Could you ...?" Have your learners read aloud the 'A' statements to a partner who responds with his / her own request. 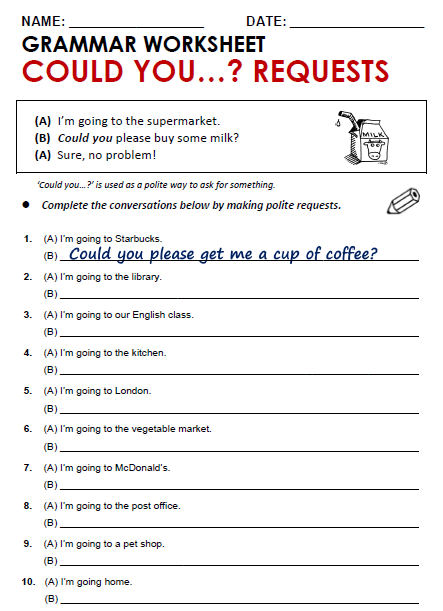 14 cards for conversation practice using "Could you ...?" Modelling this grammar speaking activity with one or two of your students is very important. 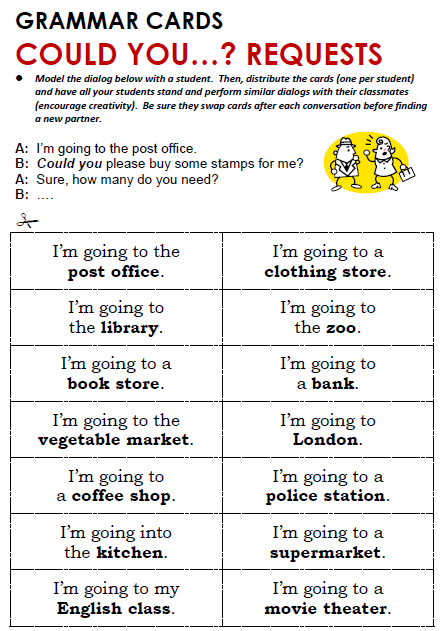 Encourage creativity with such sentences as: (A) "I'm going to the zoo." / (B) "Could you please say 'hi' to the elephants for me? / (A) "Sure, which elephants do you want me to say 'hi' to, etc. Monitor carefully and wrap-up by having two students perform a dialog for the class. Consider the possibility of having your students write some of the dialogs for homework, and maybe even them to write a short story.